You are currently browsing the monthly archive for June 2012. Rosedanie spent the first few months of 2012 preparing for her April departure to Haiti via New York and Miami. Fund-raising for the various Noramise projects occupied most of her time. She was able to attend a Miami conference on the future of Haiti where there was an opportunity to meet other like-minded people and to further collaboration. My initial impetus for returning to Haiti was not to become yet another ineffective NGO, but rather to build a food processing plant that would provide, firstly, food for the local population and secondly, much needed jobs. The urgent need for relief post the 2010 earthquake required a slight detour from that path. However, that is my ultimate goal and with perseverance and hard work I know it is attainable. TIME must be given to educate the local community on what sustainable and intentional (see mission statement) means. TIME must be taken to identify and support those who see the need for a shift in how things are done here. TIME must be given to train these same individuals on how to approach the various socio-economic and educational levels of the general population. Without this TIME, and PEOPLE in the LOCAL COMMUNITY supporting these efforts, we will only repeat the mistakes of so many RELIEF ORGANIZATIONS working in Haiti. The work on the community garden has begun. 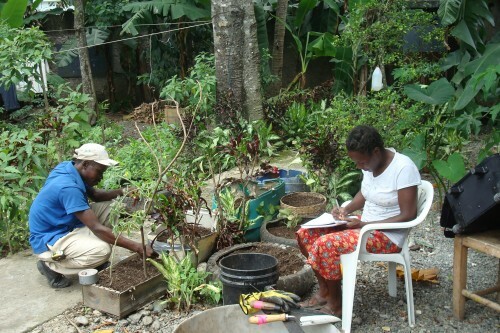 I’ve been joining the team every Friday morning clearing the land, and Lunise and Rodrigue have started seedlings at the (HHN) center to transplant to the larger garden. They have also set up a schedule to work on each members’ home garden on a weekly basis. We will be digging swales and working on Herman’s garden tomorrow, with the help of some members of the local rugby team. Students are in the midst of final exams now and will be more available at the end of the month. Daniel, Bernadin and I will present our experience from the Aquaculture workshop in Leogane to the committee at the next meeting. One of the best aspects of the workshop was the creation of RENAPTI, a resources organization of all the instructors and participants. This will allow for a forum where we can present our challenges, success and support to one another. The administrative committee is currently working on a constitution and will soon submit papers to the Ministry of Social Affairs for legal recognition. The HHN aquaculture committee (Daniel, Delano, Bernadin and myself) will be meeting with the Masabiel farmer’s association next week to update them on the project and get their input. Director Badio from the Ministry of Agriculture has offered to give a one-day seminar to the farmers in the coming weeks. He will let me know when he is available. He has also offered to provide a team to supervise the construction of the ponds when we reach that stage and to donate the initial stock for the ponds. The materials purchase for the Jam Project are still in Miami with Alfa Aero awaiting the funds to ship them to Haiti. I am looking into other shipping options. Will be meeting with the women’s (jam-making) collective next week for the first time, in order to get a better sense of who they are and how to proceed. Zafen, the entrepreneurial branch of Fonkoze will be giving a two day seminar in Cap-Haitien July 5th & 6th. I have registered to attend and will ask the jam collective to choose one of their members to attend. Upon returning from this seminar, we will have a plan of action for moving forward while awaiting the materials. I have been in touch with Haiti Village Health, Sonje Haiti, CRI(Carbon Roots International) and SOIL regarding further collaboration efforts. There is a new in-country Director for HVH and I hope to speak with her soon. Roberta Alvarez, DMV has raised enough money for a goat raising program which will be implemented through Sonje Haiti. Gabriel Vincent of Sonje Haiti and I plan on meeting to discuss how we will move this project forward. Ryan Delaney of CRI arrived in Haiti recently, and I am waiting to hear from him. While at the sanitation conference hosted by SOIL and DINEPA, I spoke with SOIL’s director Sasha Kramer. They are willing to send the Cap Haitien team to the St. Peter’s feast on the 24th, to give a presentation of their composting toilet and speak on the benefits of compost to agriculture. Posie Curren and her team have purchased their tickets and will arrive in Santiago June 30 where they’ll purchase the remaining supplies they need for the (mural) project. They will arrive in Limbe July 4th. The Limbé ex-pats group will help obtain and prepare visible wall space for the murals. One mural will be done at HHN center, two elsewhere. The time frame for the project is 10 days. TIME is money. Although we have been quite successful in raising funds for the various projects mentioned here, money for TIME is scarce. However, it is essential for the support of the time needed in order to bring about real and lasting change for the people of Haiti. You can support TIME with your contributions in any amount and be a proud part of a successful effort. Please see the “donations” section of our home page. Thank you.